This assortment of 6 landscape colors are perfect for machine appliqué and free motion quilting. 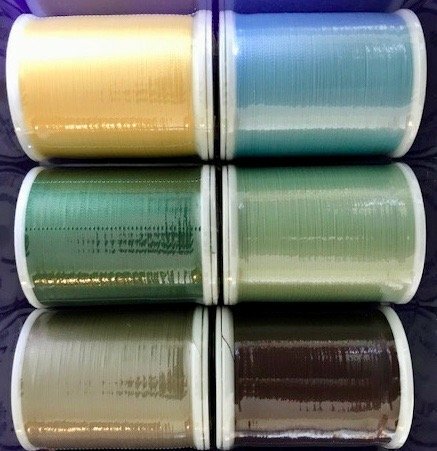 Each spool has 1,420 yards of thread!! We sell this at the same price as Superior threads does at the large shows. Light green, Dark Green, Light blue, light brown and dark brown neutral taupe. When I use Bottom line in my top and bobbin for quilting, I generally have to turn down my top tension. This is the thread I use most commonly in my quilting.